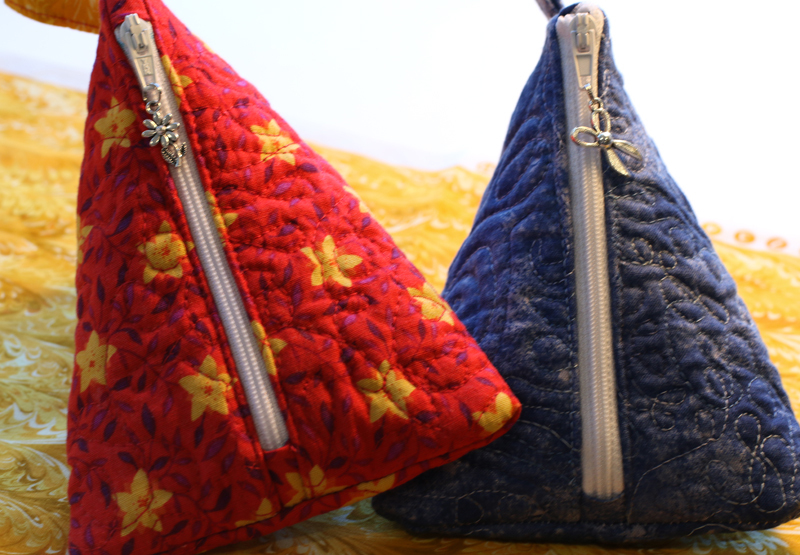 These cute triangle bags from the Moda blog were shared on our forums, and it was suggested that they would be a fun project for next week’s retreat. I thought it would be a good idea to give the instructions a test run before handing everyone materials at retreat. 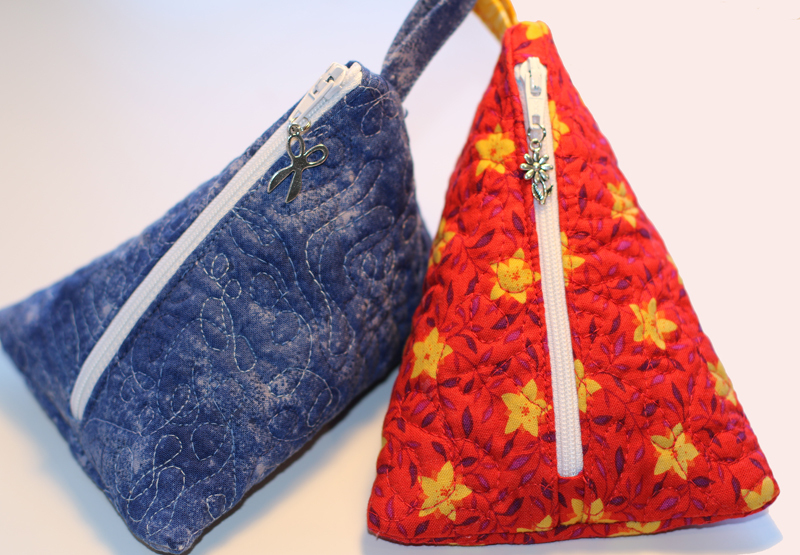 These little bags are a great way to practice free motion quilting – and as you can see, I clearly need more practice! The blue one was first, and making it was a learning experience. 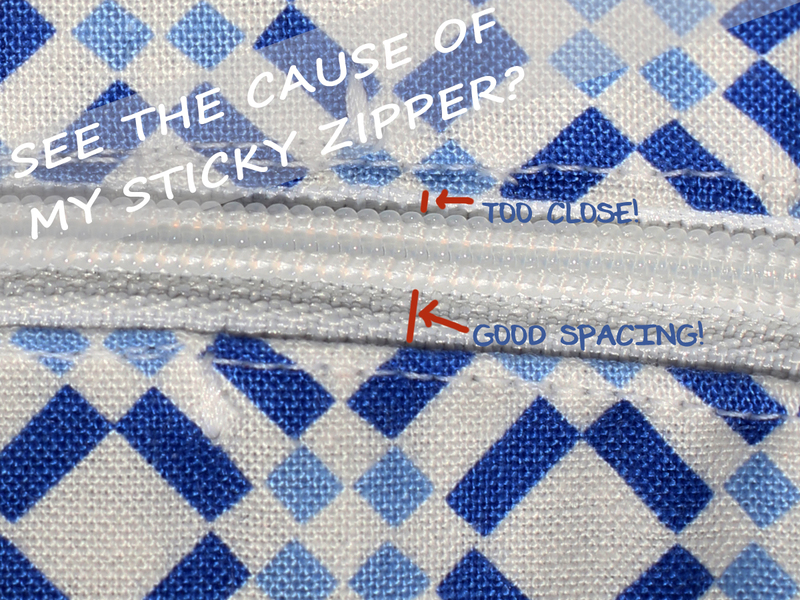 First, I didn’t make the tabs on the zipper come up far enough. See how the zip is all crazy at the end? 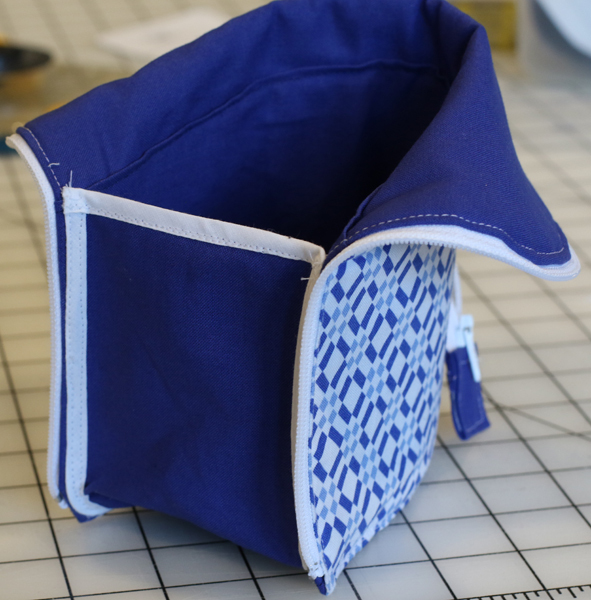 I decided to run the side seam through the serger, but that resulted in the thread pulling and being more visible than I liked when I turned the bag right side out. 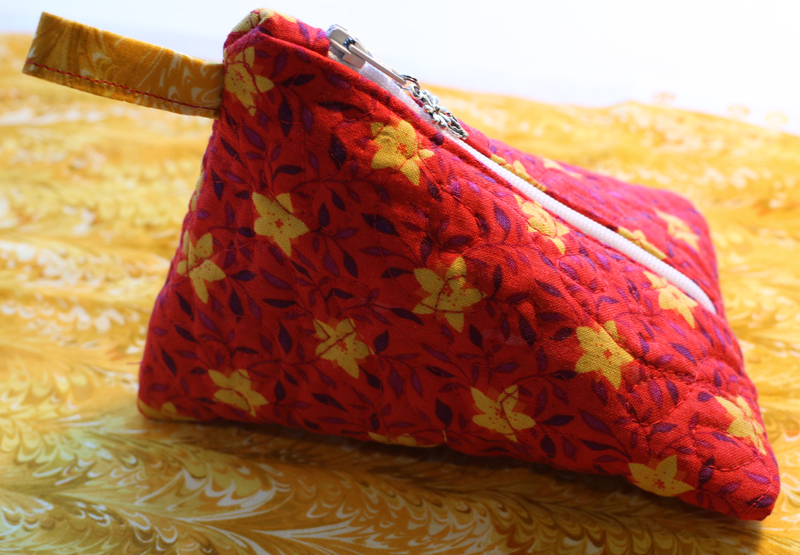 So, when I made the red bag, I sewed the seam on the sewing machine and then just used the serger to finish the edges. 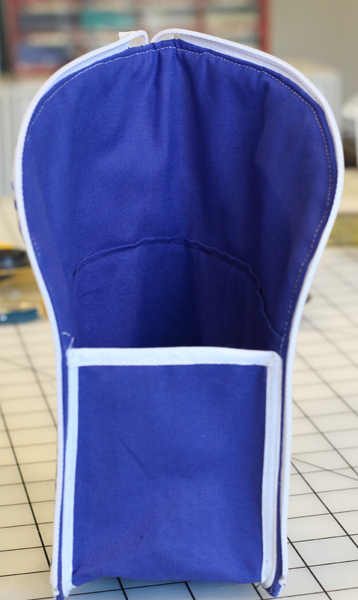 I used a narrower 3-thread overlock stitch for the finishing, especially on the zipper where there just wasn’t enough space to get in there nicely with the serger foot. Also, because reading directions is not always my strong suit, I forgot to topstitch the first side by the zip before I had attached the other side. 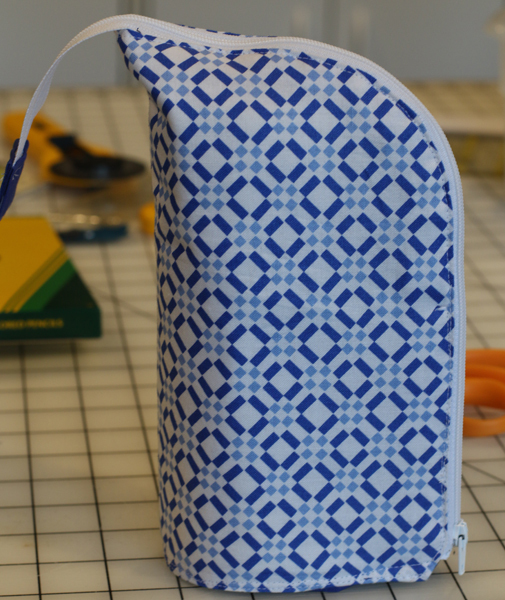 This meant topstitching both sides while it the bag was in a tube shape, which was not fun. It probably would have been faster to just rip out one side to at least topstitch the first side more easily. But where’s the challenge in that? Ha. 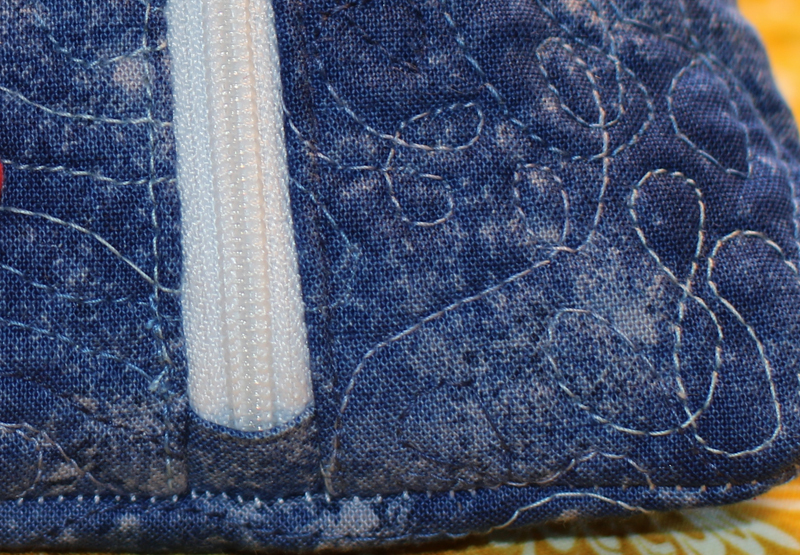 See how the top of the zip looks so much cleaner when I placed the zipper tab in the right spot? Directions. Crazy how much reading them helps! One note, though – as long as you have a rectangle, the dimensions can be whatever size you want. 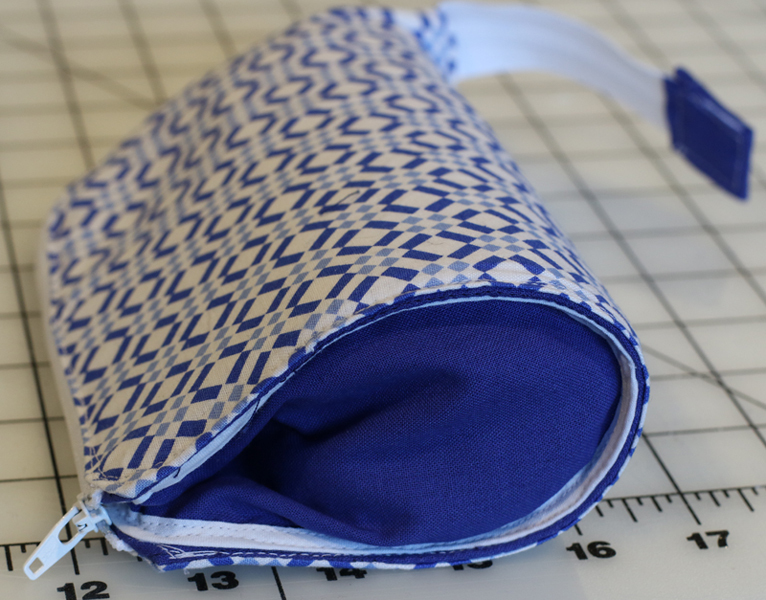 You just need a zipper that is long enough for your bag. 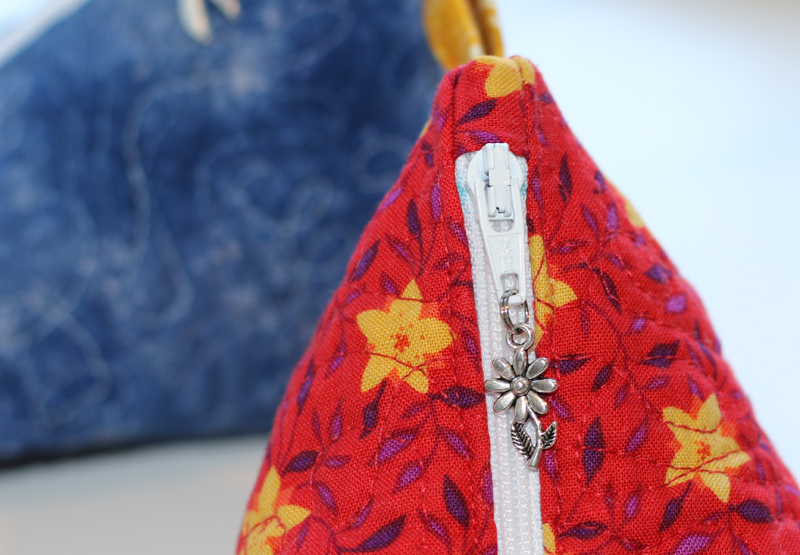 Don’t you love these cute little charms attached to the zipper pull? 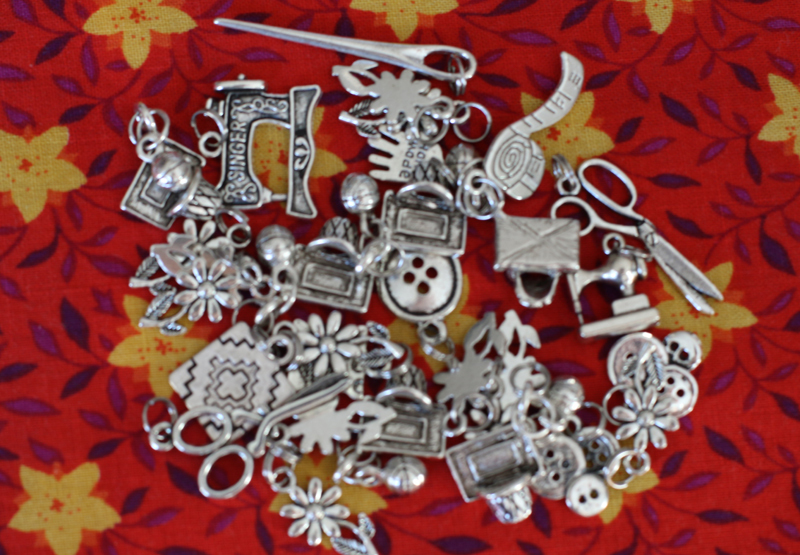 It took way too long to connect the pile of charms to split rings, but they are such a fun addition. Definitely worth it! Pop over to the Moda blog, read the instructions better than I did, and have fun making some of these! 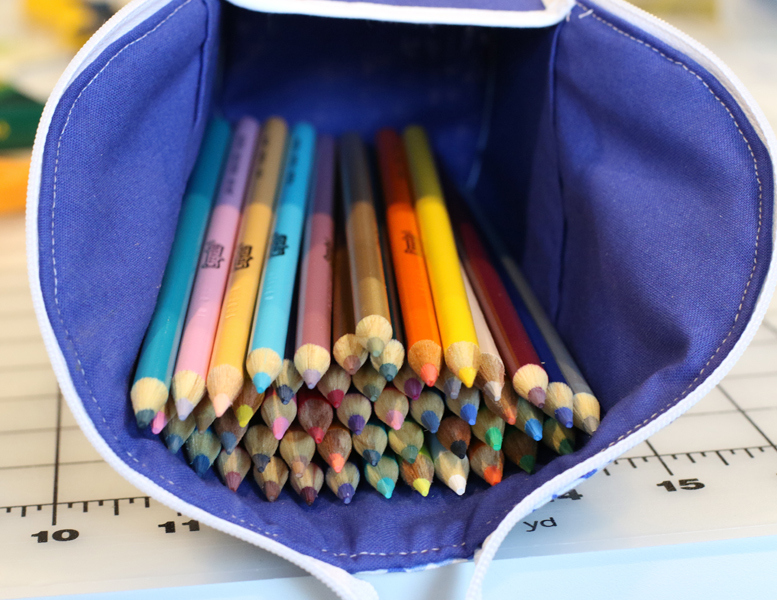 First up – Tula Pink! Here is a little peek at the True Colors and Eden Collections from Tula Pink. 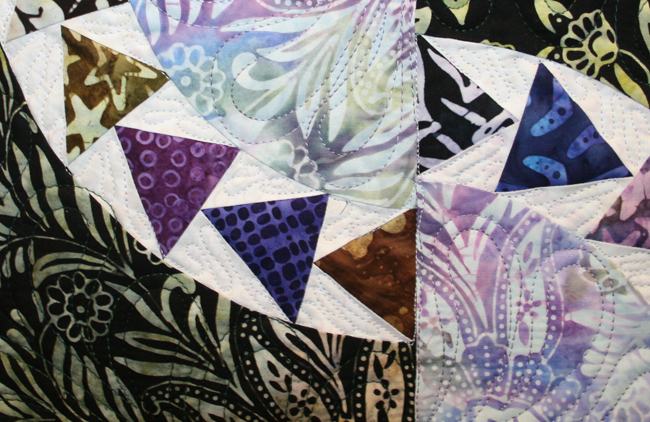 The quilt on the left has fabrics from the Eden line, the center quilt is True Colors. Tula had her own booth at Market, but I only have this one little picture of her fabrics, though I remember visiting her booth with the most amazing butterfly quilt – it was huge and the quilting on it was super awesome. Check out her IG feed for pictures of the quilts she had hanging on the ladder in her booth – there was a blue/green one, a purple one, and a pink/red one. 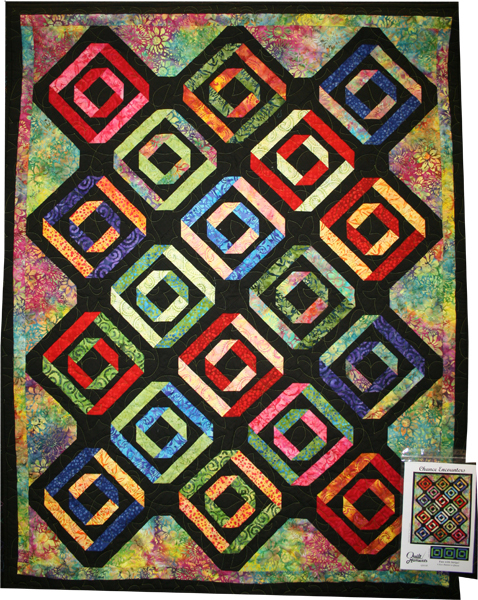 The quilts are all the same pattern, but the colors make you focus on different parts. The True Colors collection is available now, but you have to wait until September for Eden. 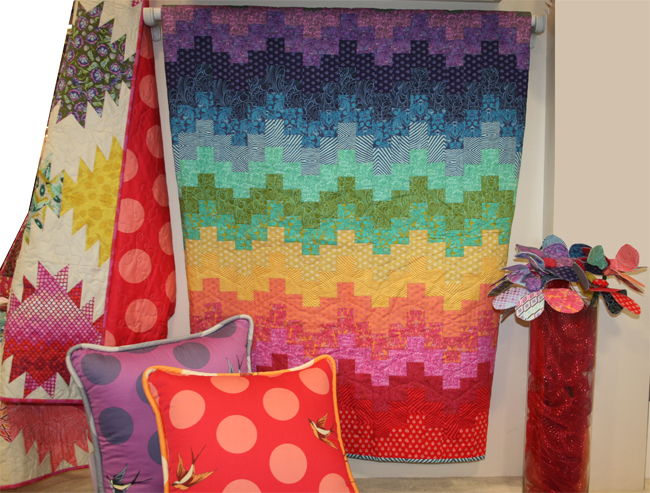 Here are the Modern Solids and New Bedford Collections by Denyse Schmidt. The Modern Solids are available now and New Bedford is shipping later this summer. There’s also promise of a reprint of some of the fabrics from the much loved Katie Jump Rope line – but no official announcement with a date on it that I’ve seen. 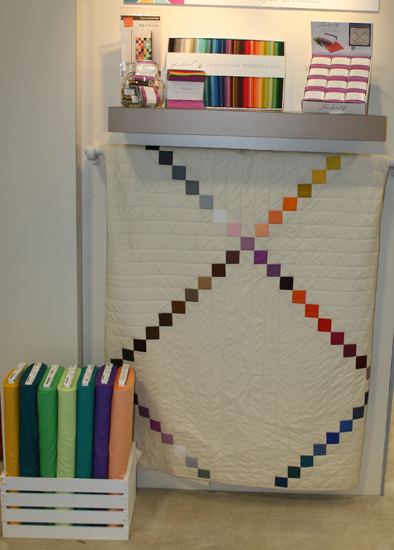 I had never heard of Anthology when I first went to Quilt Market last year. 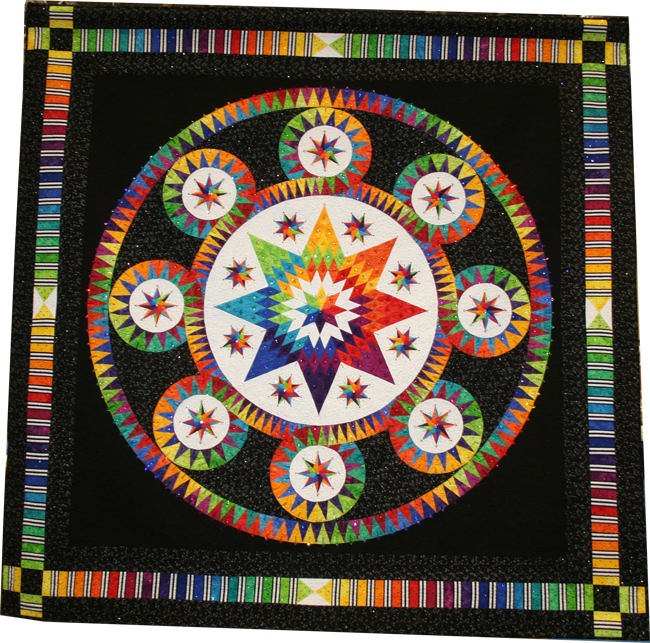 They had an amazing display of gorgeous quilts at the Spring 2014 Market, and their most recent showings did not disappoint. First of all, I will never cease to be impressed by the use of triangles to make curves. So gorgeous. And the piecing on this – amazing. This next quilt is called Goose Garden. 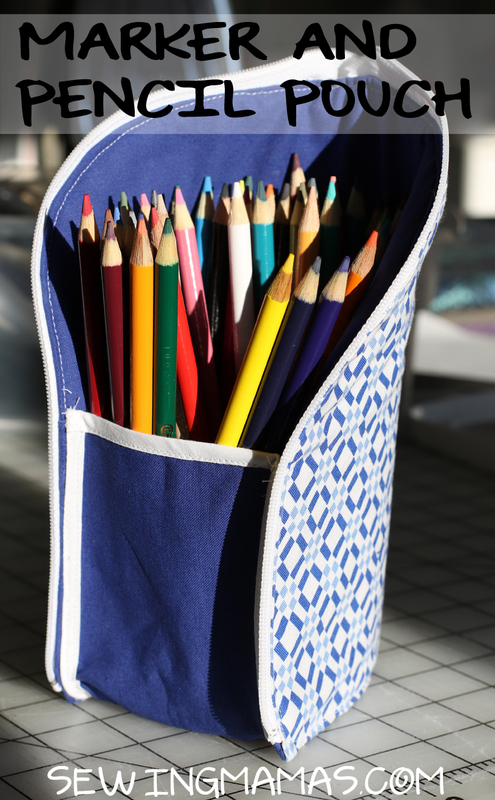 It was designed by Elisa Wilson of Elisa’s Backporch Design and the pattern is available on her website. 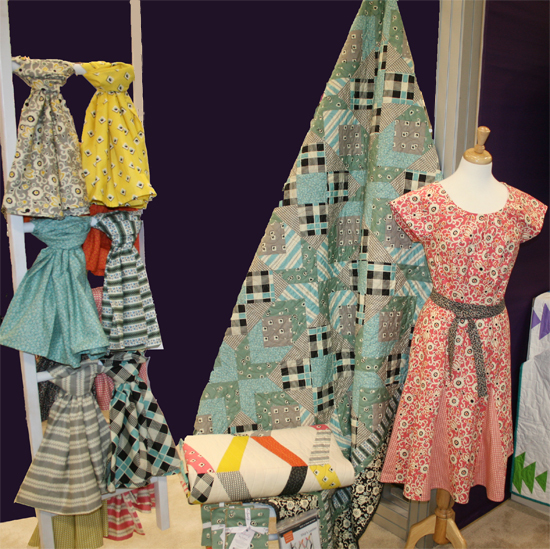 The fabrics are from Anthology’s Cosmos in the Field collection. 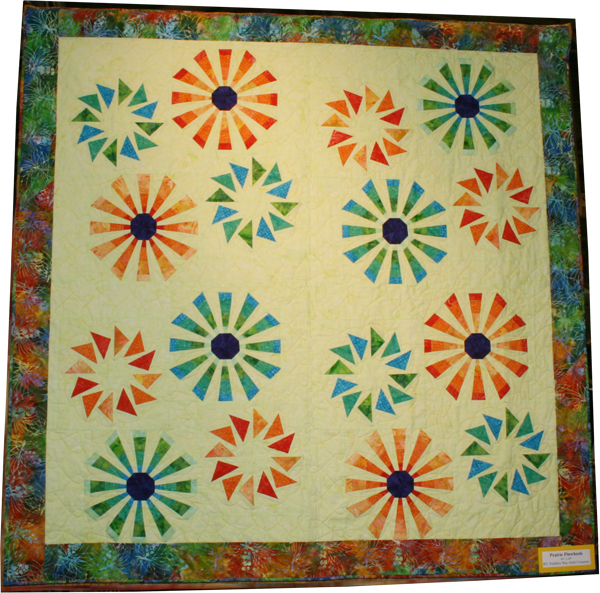 This is Prairie Pinwheels and it was created by Peddlers Way Quilt Company. 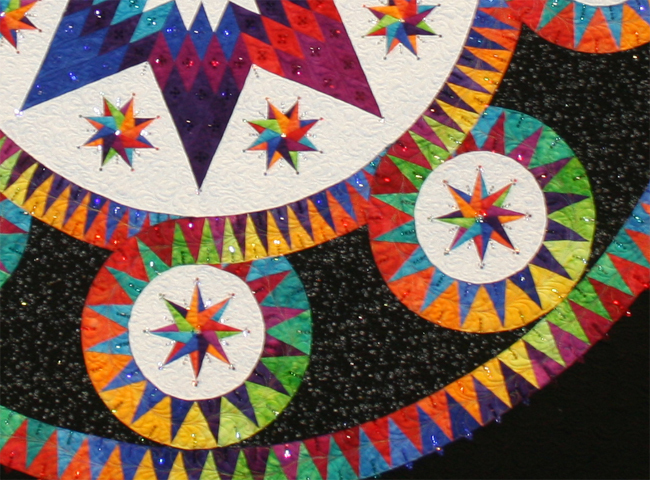 The Prairie Pinwheels pattern is a foundation paper pieced pattern. 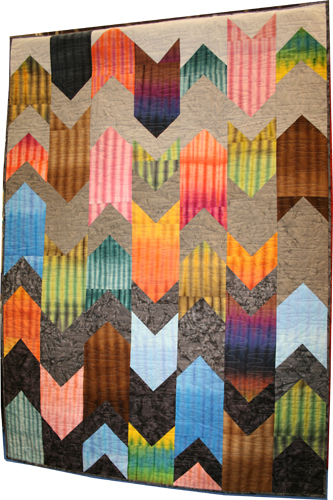 The Shibori Hand-Dyes Collection is gorgeous, and the photo hardly does this quilt justice. The pattern is called Transference and it was created by Tammy Silvers of Tamarinis. 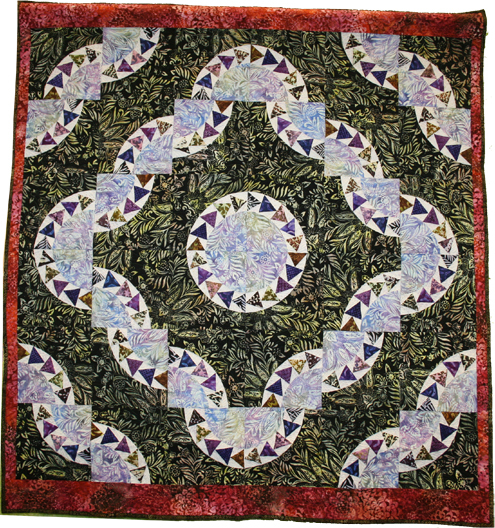 This quilt was designed by Marilyn Foreman of Quilt Moments and uses fabrics from the Flowers Collection. Last but not least, one of my favorites from Anthology – The Red Door. 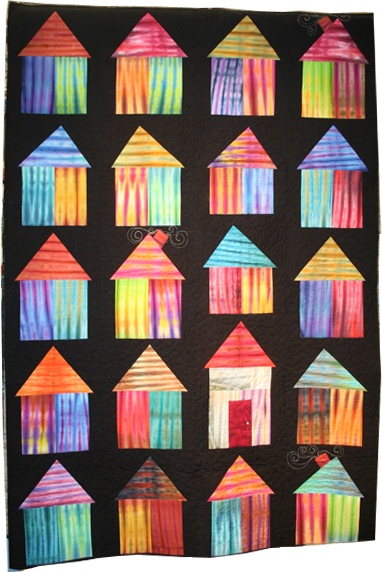 This quilt also uses fabrics from the Shibori Hand-Dyes Collection. 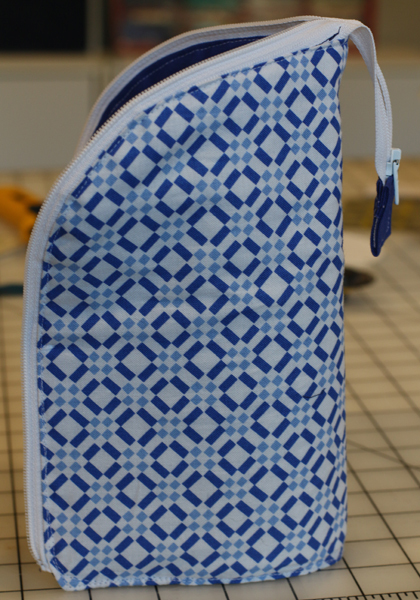 The pattern was designed by Jayme Crow and is available at Bella Nonna Design Studio. 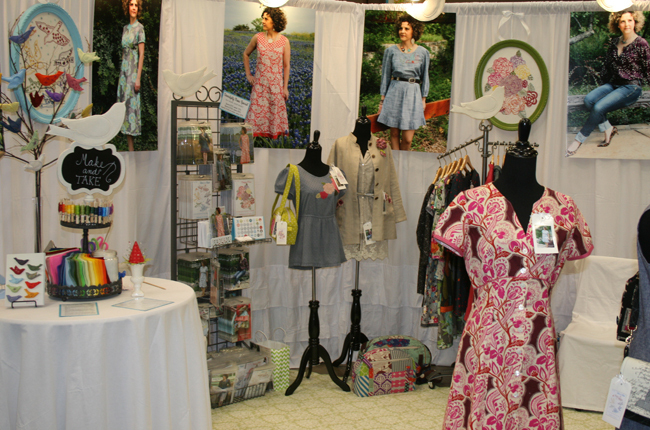 Here’s the Serendipity Studio booth at Spring 2015 Quilt Market. They had a cute little make and take project to sew a little bird. I’m so bummed I missed getting a pin at this shop! 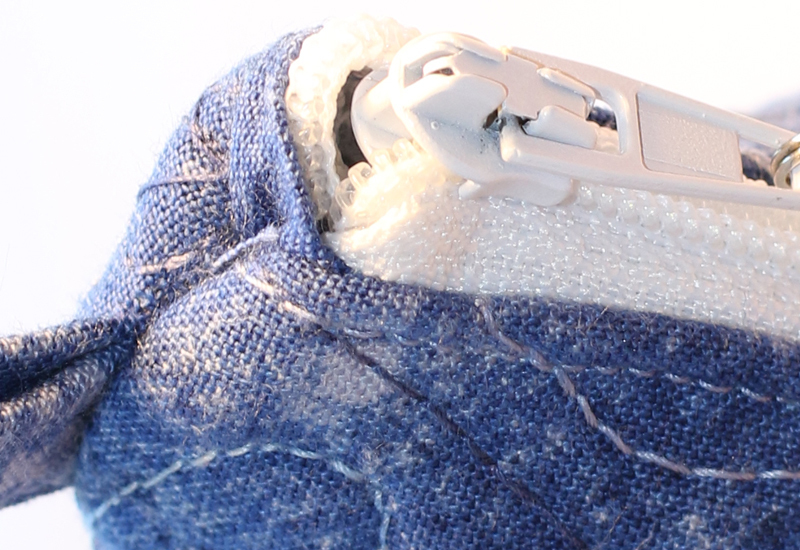 It was nice to see the sewn up patterns in person. Though Kay has great photos on her patterns, there’s something about actually seeing them in person that really makes me think I need them all. Her spring collection includes the Aspen tunic pattern, which is shown sewn as a dress or tunic on Kay’s blog. I love the Dakota Duster and Rhiannon Shirt patterns from her fall 2014 collections, too. One of these days I’ll have to give them a try! 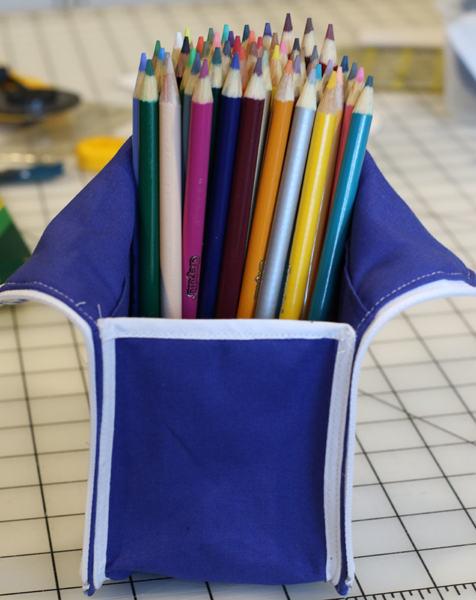 Have you tried any patterns from Serendipity Studio? Do you have any favorites to recommend?